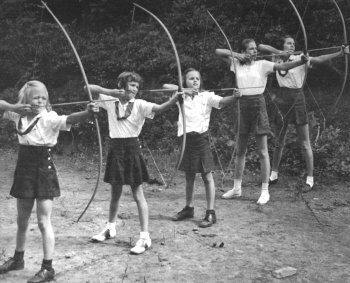 Operating from 1914-1965, the girls’ camp at Little Switzerland operated under two ownerships, and is purported to be the first girls’ camp in the Western North Carolina Mountains. The Camp’s creation at the same time as the establishment of the summer colony in 1910 was fortuitous. From 1914 to 1925 when the total number of campers for each summer season had reached 75, there were a total of over 600 extra visitors to the camp, whose presence in Little Switzerland would have been an economic and social boost to its fledgling development. The first camp, “As You Like It,” named after the Shakespeare comedy of the same name, was owned and operated from 1914-1945 by Miss Marion Dwight of Charleston, S.C. The majority of the campers during this time were from the Carolinas. The location of the camp set the tone for its close connection to nature, as it was located deep in the woods, two miles from the village. Proof of this undisturbed setting was the abundance of owls, especially the Great Horned Owl. The beauty of the camp grew as it matured and this can be attributed to, Miss Dwight and her efforts to preserve the naturalness of the setting, to Wood Hollifield of Turkey Cove, a stonemason whose extraordinary work at the camp in the 1920s and 1930s has withstood the ravages of abuse and neglect and to Lester McKinney, caretaker, gardener, carpenter and friend of the ‘girls’ camp for its entire existence. From 1945-1965, Miss Jennette Boone (known by her friends as Dan) and Miss Helen McMahon of Sweetbriar Virginia owned and operated Camp Glenlaurel, the second camp on ‘the site. Having purchased “As You Like It,” from Miss Dwight this camp attracted campers more from the Southeast. Helen and “Dan”< had both worked at a camp mimed “Allegheny” in West Virginia. The Camp did not change much in appearance, but the inevitable passage of time brought some differences. A camping trip to Mt. Mitchell in 1915 required three days; two train rides and a five mile hike to reach the summit: By 1945 the campers could ride to Mitchell in a large truck, hike and then travel back to camp in only’ a few hours, (greatly facilitated by the completion of the Blue Ridge Parkway here.). Helen McMahon and Jeanette Boone sold Camp Glenlaurel in 1965 and retired to Little Switzerland. The camp changed owners twice more the next three years, neither owner having enough capital to successfully operate it. Finally it was sold to a group of developers and the camp itself was for all intents and purposes lost. An increase in area land values now made it impossible to run a small old-style camp of about 100. The era of the “mega-camp” had arrived. The final chapter of this story is especially difficult for those of us who loved the Camp. Over time, the property was logged, robbed, vandalized and burned. To go there now, for me, is to be obliged to see it in my own imagination. It was indeed a place so magical; it exists only in my heart. I can still hear the sounds of my fellow campers singing on the way to town, or the look of the woodsy world on a summer night by oil lamp, or the color of a classic book borrowed from the camp library in my mind just before sleep overcame me in my little cot. The priceless magic of the camp and of summers in Little Switzerland as a whole have shaped me and helped to make me who I am. Coles Jackson is a third generation summer resident of Little Switzerland.